This takes sweet and savory to a whole new level. It is a perfect two bite appetizer that is easy to grab off of a buffet line and will delight your guests with a flavor they have never had before. 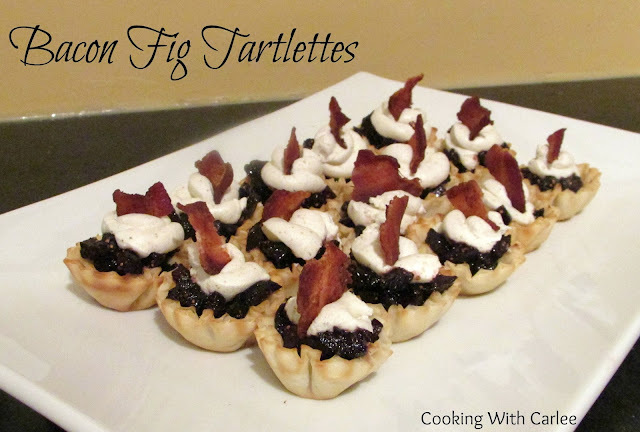 The sweet figs, tangy goat cheese and salty bacon make for a great balance of flavors. 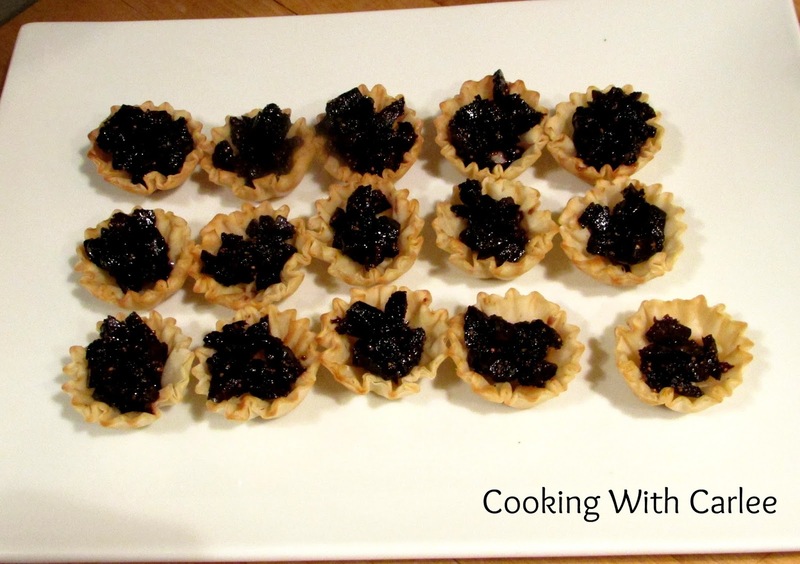 These tarts are really easy to make. It just takes a handful of ingredients and a few minutes of assembly and you will have a pretty and delicious little bite. My cousin Emily was over for cousin cookie day part 1 and while I had her working, I snuck these in too! She was happy to help put them together. We had a great time making all sorts of goodies! In a small saucepan stir together chopped figs, sugar and red wine. Cook over medium heat for about 15 minutes, stirring frequently, until it becomes thick and syrupy. Remove from heat and let cool. In a small bowl, beat together goat cheese, cream cheese, lemon juice, thyme and a pinch of salt and pepper. 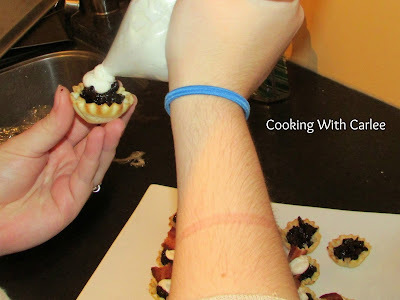 Spoon the cheese mixture into a small piping bag or plastic baggie. Spoon fig mixture into toasted shells, pipe a dollop of the cheese mixture over the figs. Top with a small piece of crispy bacon. Scrumptious! And this dessert looks so pretty too! Pinning! These sound fabulous! What a great party recipe. I have to admit that I've never made anything with figs before, but I'm going to give these a go! I haven't done much with figs either, but it seems like the thing to do at Christmas. It's no figgy pudding, but at least it's a figgy tart! Love this combo! Who needs dinner when you have a tray of these?! I love fig and bacon! This is a great appetizer. Pinning! I really loved the combo! Thank you! Hi Carlee - I never in a million years would have thought of this flavor combo, but as soon as I saw it, I thought "That's so right together!" I can't wait to try them! Thanks for sharing this on Throwback Thursday - I'll be pinning it to our board, so make sure to follow! :) Happy Holidays! Thank you! They were a lot of fun to make and it was even move fun to watch people look at them and try to decide what they were! The bacon drew them in every time! Thanks for hosting! I don't think I've ever known anyone to go fig picking. Sounds like fun! Mmmm... I was just think about appetizers for Christmas Eve (Yes... I really am that far behind!) And these sound perfect! Now... Can I get husband to eat figs? That's the question! These look like such a nice, elegant, snack! Thanks for linking up to the Country Fair Blog Party! Thank you! They were fun to make and serve! What a great little appetizer Carlee!! Thanks for sharing on My 2 Favorite Things on Thursday! I'm excited to start the party back up this week...hope you can come join me! Happy New Year! Pinned! Thank you! I can't wait to party again!